There’s a pho­to that’s been doing the rounds on social media. It shows a crowd of peo­ple at an event, all of them using their mobile phones, pre­sum­ably as cam­eras to cap­ture the event. 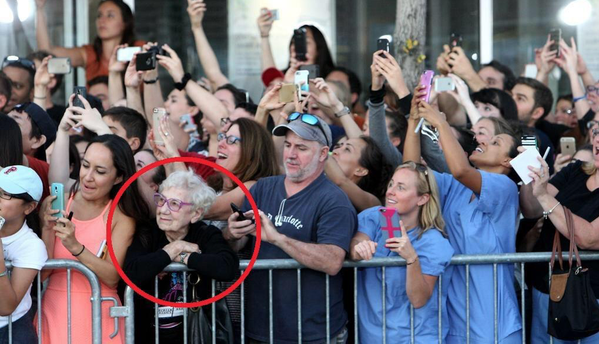 The excep­tion is an old lady at the front, who has no phone in her hands and is look­ing at the event direct­ly. Lady doesn’t own a camera phone, wishes she does. Lady forgot to charge her camera phone battery before she left the house. Lady is not engaged with what’s happening, is waiting for something more interesting. Lady has no idea where she is or what’s going on. Images in part derive their pow­er from the fact that we are exclud­ing so much of the world. This pic­ture cap­tures a sin­gle moment in time: you can’t see what hap­pened before, or after. It’s also a sin­gle point in space; you can’t see what’s out of frame. If there is an objec­tive truth, it’s very unlike­ly to be present in a pho­to­graph offered with­out con­text.